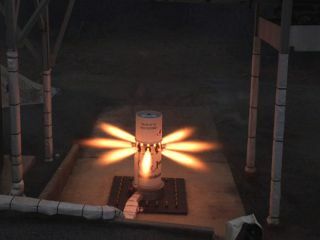 Eight high-powered thrusters fire 7,000 pounds of steering force during ATK’s Attitude Control Motor ground test. WASHINGTON ? As the administration of U.S.President Barack Obama prepares to propose changes to NASA?s human spaceflightprogram in the president?s 2011 budget request to lawmakers Feb. 1, anindependent NASA safety advisory panel is warning the space agency againstabandoning its current plans. In an annual report issued Jan. 15, theAerospace Safety Advisory Panel cautioned the United States against haltingwork on NASA?s AresI rocket to fund unproven commercial alternatives. ?To abandon Ares I as a baseline vehicle foran alternative without demonstrated capability nor proven superiority (or evenequivalence) is unwise and probably not cost-effective,? the report states. Designed to launch the Orion Crew ExplorationVehicle into low Earth orbit, Ares I is a keyelement of Constellation, NASA?s five-year-old effort to replace the spaceshuttle with rockets and spacecraft optimized for the Moon. The Aerospace Safety Advisory Panel reportpraises Ares I as a vehicle ?designed from the beginning with a clear emphasison safety? and notes approvingly ?that Time magazine cited the Ares rocket asthe ?best invention of 2009.?? The future of Ares I, however, came intoquestion last year when a White House-appointed committee led by formerLockheed Martin chief Norm Augustine urged Obama to consider droppingAres I in favor of paying commercial firms to transport astronauts to theinternational space station. NASA awarded a pair of contracts totaling$3.5 billion in December 2008 to Dulles, Va.-based Orbital Sciences Corp. andHawthorne, Calif.-based Space Exploration Technologies (SpaceX) to haul cargoto the space station aboard unmanned vehicles the companies say could evolve tocarry people. SpaceX, in particular, has been urging NASAto commit billions of dollars to fostering development of commercial crewlaunch services through the expansion of the Commercial Orbital TransportationServices (COTS) the agency created in 2006 to subsidize development of newcargo delivery systems. SpaceX and Orbital stand to receive a combined $450million under the COTS program for their competing unmanned systems by the timethe two complete demonstration cargo flights. While the Aerospace Safety Advisory Panelreport notes satisfication with the COTS program?s evolution, progress anddemo-first approach, the panel expressed concerns about NASA expanding COTS inthe absence of a clear human-rating process for commercial vehicles. Specifically, it says NASA?s currentprocedures ?were not specifically intended to establish requirements forvehicles produced by entities external to NASA, such as COTS firms orinternational programs.? The panel recommends NASA accelerate itsefforts to develop a human-rating process for would-be commercial providers. ?It is the Panel?s position that noCOTS manufacturer is currently [human-rating-requirements] qualified, despitesome claims and beliefs to the contrary,? the report states. ?Questions thatmust be answered are: What is the process for certifying that potential COTSvehicles are airworthy and capable of carrying astronauts into space safely? [and] How is compliance assured over the life of the activity?? The panel also took issue with the Augustinecommittee?s decision to embrace the outsourcing of human spaceflight withouthaving conducted a safety analysis of the commercialconcepts SpaceX and others presented to the committee last summer. ?In making this recommendation, the[Augustine] committee also noted that while human safety never can beabsolutely assured, safety was assumed to be a ?given,?? the report says. ?ThePanel believes that this assumption is premature and oversimplifies a complexand challenging problem because there is not a ?cookie-cutter approach? tosafety in space.? The report points to the Ares I program as anexample of the right way to go about ensuring astronaut safety. ?Its architecture was selected by NASA?sExploration System Architecture Study (ESAS) team because of its potential todeliver at least 10 times the level of crew safety as the current shuttle,? thereport says. ?The launch vehicle configuration has been developed to providethe best possible allowances for crew escape in the event of a launch failure.The independent launch escape system pulls the capsule clear of the launch padand any attendant explosion or fire. The demonstrated high reliability of thesolid rocket booster (SRB) suggests a low likelihood of first stage failure onascent, but the launch escape system would cover even this low probability of failure.? The panelists warn that switching from a?well-designed, safety optimized? system to commercially-developed vehiclesbased on ?nothing more than unsubstantiated claims would seem a poor choice,?according to the report. ?Before any change is made to another architecture,the inherent safety of that approach must be assessed to ensure that it offersa level of safety equal to or greater than the program of record.? The report also warned against extending thelife of NASA?s fleet of aging space shuttle orbiters ?significantly? beyondtheir planned September 2010 retirement absent a thorough vehiclerecertification effort. ?With sufficient money, manpower, andrecertification efforts, it is possible that the Shuttle could be extended,?the report states. ?While we are aware of no major systems that are ?on theknee of the curve? of wear out, the funds needed to allow full recertificationare substantial, and the probability of finding things that demand even moreresources during recertification is very real.? NASA plans to launch five more shuttlemissions by October, shut down the program and transfer the three orbiters tomuseums and science centers. Once the shuttles stop flying, NASA intendsto buy rides for its astronauts on Russian Soyuz vehicles until a new service ?either commercial or government ? materializes.